I love watching buildings being blown up. (Actually imploded…the demo companies prefer everything collapse inward, rather than being blown outward.) I don’t know which is better, the collapse of the building, or the cheering dust-covered crowd. 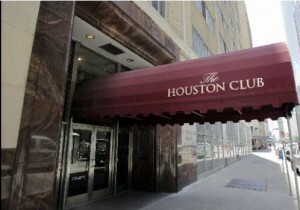 Either way, here is a chance to watch another on Sunday October 19th, when the downtown Houston Club is scheduled to be demolished. D H Griffin Co. has been working for a year on the prep. The close quarters of this building is making everyone around it twitchy. This 18 story tower is bounded by Capitol, Rusk, Milam and Travis. The Chronicle article on this did not have a time for the button push. It’s typically early. I also think they are trying to discourage on-lookers. I did hear one TV station say they would have a live feed of it, but don’t remember which…sorry. John Angelina of D H Griffin says he always has butterflies before a big job like this, but he has never screwed up. He also has the record at the time for the biggest tower imploded, so it’s not his first time.